Take a look at the picture to the right. 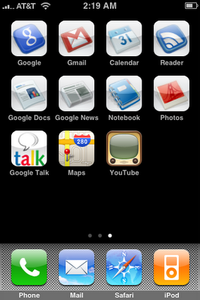 Is this a preview of what Google apps will look like on the upcoming Android-powered, non-Google Gphones? All the Google apps nestled together in a nice, tidy bundle? Of course this is the iPhone interface, but change out the icons at the bottom and with Google.com, Gmail, Calendar, Reader, Docs, News, Notebook, Photos (Picasa), Google Talk, Maps, and YouTube already set up, this could be what the so-called Gphone might look like, no matter if it’s manufactured by Samsung, Motorola, LG, HTC, or Sony Ericsson. As if not to completely disappear in the onslaught of iPhone 3G, MobileMe, App Store, and software update 2.0 news of the past week, Google snuck in its brand twice — once for the Google Mobile App (available for free at the App Store) and, more importantly for the Google faithful, significant improvements to Google.com for the iPhone and iPod Touch. Steve Kanefsky, a software engineer for the Google mobile team, highlighted the improvements to Google.com on the Google Mobile Blog Friday. Google now loads twice as fast as previous iterations, and not just because the iPhone 3G is faster. Google apps also load quicker on AT&T’s slower EDGE network, used by all original iPhones. Access to Google’s Calendar, Gmail, and Reader are still on the “home” page and other Google apps can be found by tapping the “more” tab. The user interface, however, has been tweaked in order to provide more search results by eliminating wasted space. Another nice touch is when you click on a search result, the page opens in the same Safari window — not a new one. You can instantly return to search results or Google home page by tapping the back button. And not that you couldn’t do this before, but you can more easily create icons of your favorite Google apps. Go to the application, select the “+” at the bottom of the screen, then tap the “Add to Home Screen” button to see a new, nicely designed icon for each program. None of this is stop-the-presses news, but it sure feels like Google is trying to remain a good neighbor while the development of Android-powered mobile phones drags on. And on.